This newer version of Data Asap currently only supports MySQL databases at this time. Note: If you need to work with a MS Access database or SQL server database, you can still do so. Visit our website at www.data-asap.com to download an earlier version of Data Asap, for the time being. Under “Security”, enter the user name and password needed to connect to your database on the server. 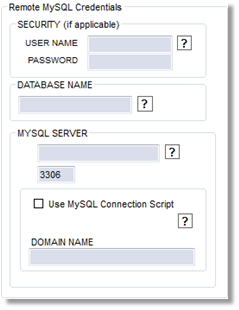 Also enter the database name, as well as the domain name or IP address for the server that hosts the Mysql database. If you need to use a port other than 3306, enter it below the domain name / IP address. Be sure to click “TEST CONNECTION” to verify that the information you have entered is correct and that a connection is successfully made to the database! DEMO PROJECTS: If you loaded one of the demo projects on the “Manage Screen” screen, click either “Autos” or “Houses” at the top of the screen to have the demo tables added to your database.